Scallywag - Ready Steady Gone! By 1971 things were starting to change in the local band scene. Whereas a few years earlier, bands had been happy to emulate their favourite artists by covering their material, now they wanted to be like them by writing and performing their own songs. It was considered to be the only way to achieve national success. However, unless you were famous or had a big following in the area, local audiences generally preferred music they knew. At the same time mobile discos were becoming more popular. 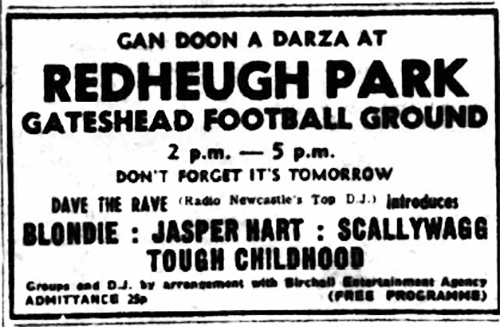 Although it was a few years away from the full blown discotheque craze, which started around 1973, some venues were starting to book discos in favour of live bands. At the very least it was cheaper and they could give the punters the music that they were familiar with and would dance to. Scallywag in 1971 (left to right standing): Steve Ross (drums), George Irving (bass/vocals), Trevor Benyon (vocals/guitar) front: Jim Hall (flugelhorn) & Roger Smith (sax). “It was around about mid 1970 that what would ultimately prove to be a killer virus began to spread insidiously through-out the (music) industry. It was called Big George, and we all loved him – and he loved us…! He was one of the guys, a true spirit, deeply involved in the perpetuation and development of good music; but, like most viruses, he was exponentially ubiquitous. Long before Sneeze finally split in the spring of 1971, most of the band members had lined themselves up with new projects. By this time Jimmy Hall and I had been playing together for over four years as a horn section and had gained a good reputation in the North East. We were asked to join Macawber, a five piece band from the Throckley area of Newcastle who played their own material. Jimmy declined the offer but the band said that they would still want me as a solo sax player. Macawber had a following in the west end of Newcastle but were not widely known outside of the Newcastle area. The main singer and song writer was the band’s guitarist, Trevor Benyon. His old school friend George Irving, the bass player helped with the song writing and provided excellent harmonies. They had a solid drummer called Stevie Ross and a front man called Colin, whose voice was nowhere near as strong as the other two. After a few weeks of rehearsal, Jimmy Hall decided that he would like to be part of the band, which had been renamed Scallywag. We set about rearranging Trevor’s songs for a horn section. The front man, Colin, was not included from the new line up. The overall sound worked well but when we actually started gigging, most audiences didn’t really show much interest in the original material. It was only when we did the odd cover, for instance “You Really Got Me” by the Kinks, that things livened up. However, the band got plenty of bookings, mostly through the Ivan Birchall agency. Some of the gigs were repeat bookings but many were as a result of the hole left by the break up of Sneeze. 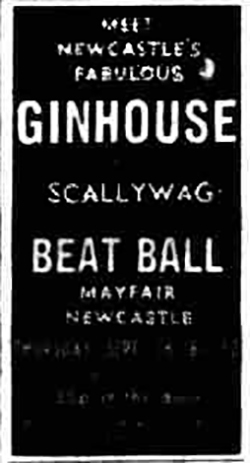 Scallywag played at a lot of the venues I had been to with Sneeze, for instance the Mayfair in Newcastle, the Rex at Whitley Bay, the Viking and the Dolphin at Seahouses, the Locarno at Sunderland. But with Scallywag, there were no really prestigious gigs, although we shared the stage a few times with some fairly famous bands at the Mayfair and Viking, such as the Equals (with Eddy Grant). There were quite a lot of good bands emerging in 1971 and a lot were playing their own material. By and large, most audiences still wanted to hear covers so the popularity of local bands was starting to wane. Nevertheless some bands were still doing well and were still pulling in good crowds. A band that was really popular, in particular in the Sunderland area, was Brass Alley who mainly did a lot of Free covers. Trevor was intent on becoming famous; either with Scallywag or as a solo singer/songwriter. We recorded two demo tapes, the first at Mickey Meade’s Newcastle studio which was going under the name of “Nationwide” and the second at a small studio called Multichord in Frederick Street, Sunderland. The second session at which we recorded two of Trevor’s stronger songs was by far the better of the two sessions. I scored the songs to include the horn section and, in addition, Jimmy put in a piano part. I also put in a flute part over the top of the horns in one of the songs – ‘Bad News’. The tapes were sent off to record and publishing companies in London. There was some initial interest by a couple of companies but the band never progressed any further than the club/ballroom/college circuit in the North East. Scallywag finally broke up in 1972.